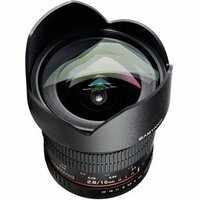 The Samyang 10mm f2.8 ED AS NCS CS ultra wide-angle lens with Micro Four Thirds fit has been carefully constructed to obtain the highest possible optical parameters, while remaining at a manageable size and weight. This f2.8 fast, manual focus prime lens provides an exceptionally wide field of view of up to 109.5 degrees making it perfect for indoor, architecture, sport, journalism, landscape and lowlight photography. The product's optics comprise 14 elements divided into 10 groups, including 2 aspherical AS lenses and one lens made from extra-low dispersion (ED) glass. This is also the first Samyang lens to feature a nano crystal anti-reflection coating system. This technology provides better light transmission, increased resistance to reflections and higher contrast. Designed for use with Olympus and Panasonic mirrorless Micro Four Thirds cameras and is a Manual focus only (no autofocus) lens.